I'm a 21 italian guy, from Florence, living in London from 3 years now. I'm studying composition at the Royal College of Music. I started to approach music when I was 5 years old, studying piano until the age of 19. From 12 years old instead I started my first composition course, changing a lot of them and studying with lots of famous teacher as Ennio Morricone, Luis Bacalov, Dai Fujikura, and others more. Even if I never graduated in piano, I can still play it at an high standard level (I didn't graduate just for lack of time unfortunately; as I'm now a full time composer). I teached a lot in the past, but since I moved in London I had to stop because too much to study. I started teaching at a really young age, when I was 16. 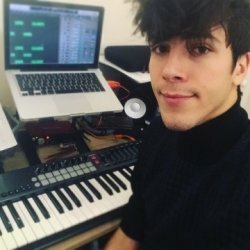 I teached piano for 3 years, composition for 2 year and music theory for 1 year. I also did a lot of baby-sitting, so I feel really confident working with children. The most important aspect for me, is doing things with passion. Passions and talents are something that we can perceive at any stage of the life. Then it comes the practice and dedication, of course depending from the person. I'm a strict teacher, but highly accommodating and understanding.